Sharp looking to bring 3D Android phones to U.S.
Japan’s mobile phone industry might be looking to re-establish itself in the United States market. Following yesterday’s news that Panasonic is looking to bring Android phones to the United States (eventually), now electronics giant Sharp has indicated it’s looking to bring its glasses-free 3D Android smartphones to the United States in 2011—as well as to China and India. Sharp is gearing up to launch its first 3D-capable handsets (the Galapagos 005SH and 003SH) in Japan on Softbank in December. The phones feature 3.8-inch WVGA displays, integrated Wi-Fi and Bluetooth wireless networking, assisted GPS, and 7.2 Mbps WCDMA more broadband, along with microSDHC removable storage. 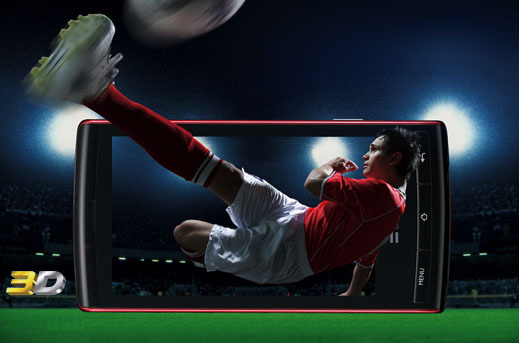 The 0005SH features an 8 megapixel camera and slide-out QWERTY keypad, while the 003SH sports a 9.6-megapixel camera. In Japan, both phones will feature bundled titles from Capcom that are playable in 3D. The phones use autostereoscopic technology and do not require 3D glasses to view 3D content. There’s no word on what devices Sharp plans to launch in international markets, but given Sharp’s timeframe, it’s reasonable to assume they will be at least close relatives of these first Galapagos handsets. Galapagos is Sharp’s broader ereader platform, which is starting off with Android-based tablets. There have been rumors that Sharp is looking to bring the Galapagos ereader platform to the United States as well, although we haven’t been able to get confirmation on any developments.